Last week, he started a thread on PubPeer, alerting readers to his concerns — namely, that a microscopy image showed hexagons with crisp edges. The author responded that the students had been working to obtain a “perfect hexagonal structure,” and had adjusted the contrast of the image to make it seamless. But, the author noted, the paper was being retracted for other reasons. -Fig. 1a (JPB) is the same as Fig. 1a (COLSUB): both the UV-visible spectra are found to be identical but in the latter paper commercial ZnO nanopowder was used and not laboratory synthesized ZnO, so these results are not in line with the expectations. -Fig. 2 (JPB) is the same as Fig. 2 (COLSUB): both these figures are identical in the concentration range 0-40 mg/L and the authors seem to have removed the data of two traces in the case of the JPB paper. -Fig 3a (JPB) is the same as Fig 3 (COLSUB): the surface properties of HA and BSA proteins are different and hence the zeta potential values are expected to have different values. However, the authors report similar zeta potential plots with negligible difference for both HA and BSA. -Fig. 1d is the same in both papers. The d-spacing values for both figures are also the same. The explanation given by the authors is not correct. -Section 2.5 as published in JPB 138 (2014), 155-159 is very similar to Section 2.11 in the retracted paper without giving appropriate reference. Fig. 1e is the same as Fig. 1f as previously published in J. Photochemistry and Photobiology B: Biology 141 (2014), 235–240, DOI: 10.1016/j.jphotobiol.2014.09.010. However, the previously published paper deals with Ag2S nanoparticles while the retracted paper deals with ZnO nanoparticles. EDX peaks are characteristic of various nanoparticles. 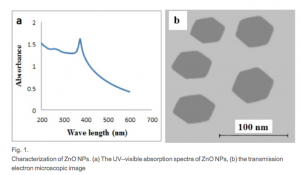 The authors have reported the EDX peak of ZnO nanoparticles at 3 KeV which is contrary to the expectations. The 2015 paper has been cited once, according to Clarivate Analytics’ Web of Science, formerly part of Thomson Reuters. For the past few years my students are working continuously in my laboratory to get hexagonal shaped ZnO NPs and we could achieve the same. The results were so perfect and TEM images were taken until we get very low noise and perfect hexagonal structure. The low noise was avoided by adjusting the contrast of the image. But, I would like to inform you that due to some other reason, the manuscript has been withdrawn from the journal and it will be appeared as “manuscript Withdrawn” soon in the journal website. For the confirmation, may be you can contact to the journal editor. -Fig. 1C is the magnified version of Fig. 1C as previously published in Spectrochimica Acta Part A: Molecular and Biomolecular Spectroscopy 137 (2015) 503–508, DOI: 10.1016/j.saa.2014.09.004. 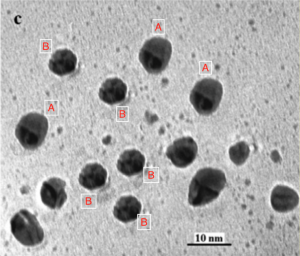 However, these papers deal with different nanoparticles: Ag2S and Ag respectively. -The degradation data in Fig. 4 is the extension of the results given in Fig. 4 as previously published in Solar Energy 105 (2014) 542–547, DOI: 10.1016/j.solener.2014.04.028. Two of the papers mentioned in these retraction notices have also been flagged by Coudert — both of which also now include comments from the authors that they will be fixed by corrigenda. We have identified the error and corrigendum is under progress. The corrigendum will be appeared in the journal website soon. It was an error and corrigendum is submitted for the other one. It will be published soon in the journal website. Khan and Chandran are listed as authors on all four papers. It amazes me how none of the editors or peers picked up anything during peer review. Dr. Chandran is a co-author of the following paper: Preethy Chandran and Nilanjana Das, “Characterization of sophorolipids biosurfactant produced by yeast species grown on diesel oil,” International Journal of Science and Nature 2(1) 2011: 63-71. According to Google Scholar, this paper has been cited 23 times. Not to be confused with the Journal of Nature and Science, which in turn should be distinguished from Marsland Press’ “Nature and Science”. I am not entirely sure how a corrigendum submitted for the first version of the image (purportedly showing Ag nanoparticles), that will explain how multiple copies of the same Hallowe’en masks particles have cloned themselves across the slide, will also suffice to explain how in the second version the nanoparticles are ZnO. If they really or actually read what was written , or they are from different research background .